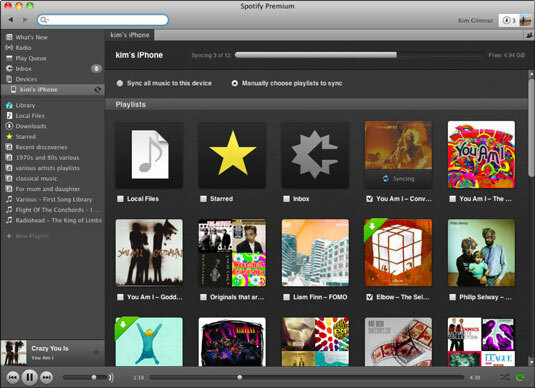 Spotify Premium subscribers can sync playlists for offline listening that contain tracks from Spotify’s streaming music library. If you’re a Premium subscriber, you don’t need to worry whether a playlist contains a song you don’t actually own as a digital file because Spotify syncs it for you as long as it’s in the Spotify music database. Open Spotify on your computer, making sure you’re connected to your Wi-Fi. Make sure your mobile device is hooked up to the same Wi-Fi connection and open Spotify on that device. On your Spotify desktop app, you see your device appear below Devices in the left sidebar. Click your mobile device’s name in the left sidebar, and then click Sync This Device with Spotify in the main pane to see a list of your playlists. By default, the option to manually choose playlists to sync is selected. Playlists themselves are always stored centrally at Spotify, but you have to initiate the act of syncing tracks so that they’re available offline. On your computer, select check boxes next to the playlists you want to sync to your mobile device for offline listening. Watch your mobile device while the tracks start syncing. A green progress bar tells you how far you have to go. As you may imagine, when downloading tracks from Spotify’s server, the process takes considerably longer than when streaming local files across Wi-Fi — but it depends on your broadband speed. Back on the Spotify desktop application, a green banner with a white arrow at the corner of the playlist signifies that it’s been successfully synced to Offline mode on your mobile device. You don’t have to use Wi-Fi to sync tracks to your mobile — it’s easy to mark them directly from your mobile device. But the Wi-Fi method is ideal if your playlists contain a mixture of both local files stored on your computer and tracks from Spotify’s library. 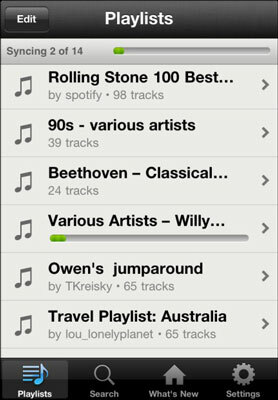 Spotify copies any locally stored files across to your mobile device during the sync.